With two rows of signature office suits, showroom and retail units, GM Corp is said to introduce a new perk lifestyle and changing the night of the immediate neighborhood. GM Corp will also feature an impressive choice of bars and restaurants, exclusive executive carpark, complete with a convenient GM buggy-transit to and from GM Mall, GM Home and GM Corp. 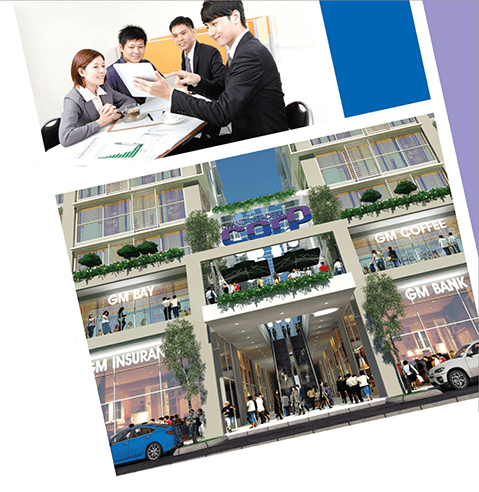 Upon completion, GM Corp will have a total gross built up area of approximately 120,000 sq.ft. spread over 6-storey (corner and first intermediate towers) and 5-storey (intermediate towers). Ground floor Galleria unit features 22ft. height ceiling with the provision of future mezzanine floor and internal stairways.